Get a professional tub replacement by Clovis Plumbing Services! Offer applies to the purchase & installation of a new tub. Bathtub repairs can be performed successfully on all types of material including cultured marble, fiberglass and acrylic tubs. Fixtures are often damaged during transport, installation or sometimes as a result of a heavy or sharp object being accidentally dropped onto the surface. When the tub is in otherwise good condition, it makes sense to perform a tub or chip repair. This type of tub repair can be done on site, which is fast and cost effective. Why repair a bathtub if you can just buy a replacement? This question is the most frequently asked question by most tub users. Bathtubs costs just around $100 and most of them can afford it. However, if they take into account the cost of demolishing, removing and disposing of the tub and the water pipes and then adding up the cost of laying tiles and flooring/carpentry, they could have an estimated value of $2,000. These costs are too high when a repair can cost them much less. 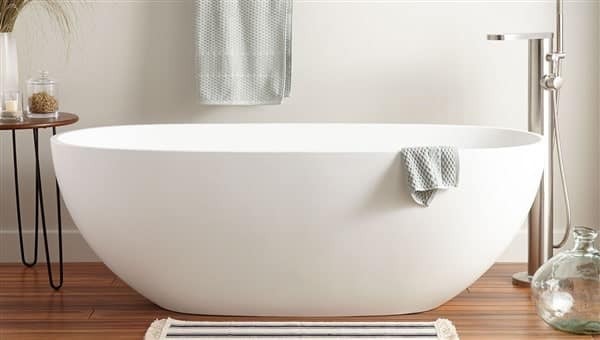 During years of use, bath units tend to have stains and will probably have scratches here and there. This includes taking those stains and scratches out. This can be done either by hired help or by yourself. Even though this can be done by untrained people, it is recommended to hire a trained person to do this for your unit. Washing the surface of the tub and applying a solvent is part of the bathtub restoration. It is then neutralized, etched and ground. If the restoration is done properly, your bathroom will get a new shine and look cleaner and brighter. After the restoration, refinishing must be done to make it last longer and to require you to restore it less than necessary. Refinishing should be performed by professionals using a special chemical. This can be accomplished in a day or two you should have your unit back very quickly. Bathtub repair professionals utilize a waterproof polyester resins to fill in chips and cracks. After sanding and filling properly, acrylic enamel is applied lightly in coats with an artist's brush. The repaired area is so carefully blended into the surrounding surface so that it can be virtually invisible. When repairing chips and bathtubs, an artistic eye for color and years of practice is in demand. What are bathtub liners and why should I remember to use them? Bath inserts are made especially for your tub. These liners will make sure that chipping and scratches on your tub are already histories. A new liner is installed and it can be done in a matter of hours. There are no additional costs, like the plumbing, floor coverings and tiles remain completely untouched. Should you do the work yourself or hire a specialist? A specialist will cost you more, but repairs to your tub last longer. If you are not doing a very satisfactory job, it is recommended that you seek help from a specialist, as the cost of hiring an employee will exceed the re-implementation effort and associated inconvenience. When should I consider buying a new bath? Buying a new bath unit is only recommended if the total cost of ownership is more expensive than buying and reinstalling a used one rather than choosing a new bathtub. Bathtubs are an important part of a fully functional bathroom in the modern home. However, they need regular and timely assistance from expert bathtub repair service providers to ensure smooth functioning in the long run. Clovis Plumbing Services has many years of rich experience in a range of home improvement solutions including bathtub replacement. Our technicians are qualified, well-trained, polite, efficient, and resourceful in their work and completely understand the importance of timely schedules and quality services to deliver great results. All these issues can be quickly fixed by our technicians without much expense if the bathtub fixtures are in solid condition otherwise. Clovis Plumbing Services provides comprehensive solutions for various bathtub repair needs at affordable prices. With years of practice and experience in the area, they take a refined and artistic approach in all of their bathtub repair work. It is best to evade all repair problems by roping in their professional services as soon as you identify an issue. We can efficiently control the situation before letting it get out of hand.